Home » india news » Teachers' Day celebrations: holy or hollow? #TeachersDay is a farce, full of empty rhetoric. Our teachers deserve better, don't they? In the absence of serious and genuine consideration, empty and sweeping slogans have become the norm for celebrating historic events or occasions. Replete with such facetious sloganeering, empty gestures, and doling out of awards to teachers, the commemoration of Teachers' Day every 5 September has come to belong to that same category of hollow celebrations. 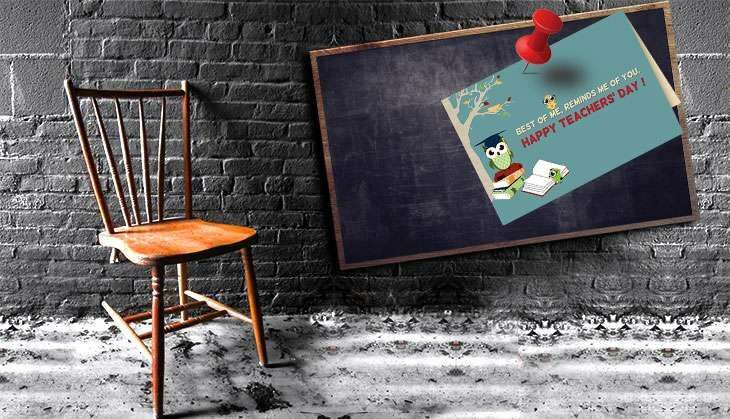 Underneath the fake smiles, flowers and empty statements by the dozen, there lies a cynical truth: teachers are one of the few categories of professionals who are always praised in rhetoric but slighted and ignored in practice. We are only capable of discussing teaching as a social service. Politicians are, of course, among the most prominent figures to celebrate this tradition of paying farcical homage. This Teachers' Day is no exception to the norm. True to tradition, Prime Minister Narendra Modi tweeted: "India salutes the dedication and commitment of all teachers, whose role in nation building is paramount." He asked the people to share their anecdotes and to "read what many others have written about their teachers". But we all know that once the day passes, teachers will once again be consigned to the margins where they will endure the exhausting and humiliating experience of grappling with ad hoc appointments, job insecurity, red tape, and the terrible work conditions in schools, colleges and universities. For instance, consider how the previous UPA government and the Human Resource Development (HRD) ministry led by Kapil Sibal pushed through the contentious semester system in colleges without adequate consultation with teachers. Or take the recent example of how the Jawaharlal Nehru University (JNU) administration and students belonging to the Akhil Bharatiya Vidyarthi Parishad (ABVP) labelled large sections of teachers as anti-nationals. But never mind the acute lack of disrespect to teachers that was recently on display! The celebratory rituals must go on unhindered! So this Teachers' Day, the JNU administration-sponsored programme has students worshipping their 'gurus' by singing vandanas to them, while some others are assigned the duty of collecting teachers' memoirs. An article published in The Indian Express sums up the hypocrisy well. In a letter to the President, the author (an ad hoc teacher who wants to remain anonymous), writes: "Our university doesn't look at us as faculty-members and rightfully so; we are adhocs. We are not addressed with our names; a common noun suffices to mention our role and contribution. It seems to be an interesting idea to do away with proper nouns in the university rolls. The university administrators recognise us as numbers and think about them only in the months of April-June because they need to be filled by real people for the 'task' of teaching. They think about the numbers and not about us as people with highest qualifications in fields of knowledge. We get subjected to a humiliating repetitive ritual of filling the forms to convey our availability to become adhocs." The author writes that, for the last two years, she has served the university on "minimum wages". She reminds the President that even though it may seem a "small thing" to him, for ad hoc teachers, "this is a matter of life and its end, leave alone dignity." Even as the volume of ad hoc teachers, both in schools and universities, has grown by leaps and bounds over the last couple of years, these professionals continue to be denied the basic rights due to them. "The university gives our minimum-wage salaries of 4-5 months together, saving a lot of the monthly work to be put in by clerks. It doesn't give us library membership, computers, password to Wi-Fi connections and real rooms to sit in," writes the author in The Indian Express. Clearly, the interests of teachers is the last thing to occupy the minds of our political classes and governments. It is a concern that is shrugged off by politicians and left to teachers themselves to contend with. The fast deteriorating state of government schools and public universities has been agitating the community of teachers for years and decades together. But is anybody listening? How many times have we heard political bigwigs including the Prime Minister talk about education and the plight of those who impart education to students? In an interview to Hindustan Times, the educationist Krishna Kumar has rightly said: "A teacher is someone who gains from the experience of working with young people. How can one expect commitment from someone who is hired for a short while and is facing chronic uncertainty? Over the last couple of years -brightest young people want to avoid this profession as they know how vulnerable it is." The core challenge today is how to restore dignity and respect to the teaching community. And this is not going to be achieved by observing day-long annual celebrations of Teachers' Day - or by the Prime Minister's sending out celebratory tweets or delivering his Mann ki Baat to the teaching community.